Vapour condenses as the Belgian display F-16 pulls a high G turn. The aircraft was moving very fast, so a high shutter speed keeps the picture sharp. I was recently asked to write a piece on photographing airshows for my local photographic society. To make it easier to access, I’m publishing a version of it here. Airshows are one of summer's most popular outdoor events: about 4 million people attend them each year in the UK. They offer photographers endless opportunities for pictures - and not just of planes in the air. Something to be aware of at any airshow are the people: pilots, ground crew, and very often re-enactors; not only that, but the other spectators and photographers offer the street photographer loads of possibilities. You don't need to take a long lens along, although for shots of individual flying aircraft, bring the longest lens you can lay your hands on. For everything else – including the patterns in the sky made by display teams – a normal standard zoom will be fine. Vintage displays at Old Warden: Railton car and Jackaroo. All airshows feature planes on display on the ground. Very often there are tours of the flight-line on offer, or flight-line walks before the flying starts. You don't have to photograph the whole plane, the details such as the curves on the lines of the props, or signs on the fuselage are worth investigating. Re-enactors interacting with the aircraft can add great atmosphere. Spitfire Mk Vb AB910 of the Battle of Britain Memorial Flight. An example of a topside pass at a dynamic angle. Since the Shoreham tragedy, aircraft have tended to fly further from the crowd line, so you'll want a long focal length lens if you want to get clear pictures of individual aircraft. Most aviation photographers use a lens that goes to around 400mm (full frame equivalent), but longer is usually better. Having said that, many aircraft (and most display teams) leave smoke trails while displaying: these can make attractive patterns in the sky, easily photographed with shorter focal length lenses. Try to look for dynamic angles on aircraft in flight, or juxtapositions of aircraft in formation. A great angle to look for is the “topside pass”, where an aircraft banks over showing its top (dorsal) surface, and coming towards you. Generally, set your camera to aperture priority (A or Av) for jets and shutter priority (S or Tv) for propeller planes. Fighter jets move really fast, so try to use a very fast shutter speed, around 1/1500-1/2000, to keep them sharp: a simple way to get a fast shutter speed using A/Av is to open your aperture wide, and set an ISO to give a fast shutter speed. This way, if the light deteriorates, you'll still get correctly exposed shots, even though the shutter speed may drop a bit. Alternatively, set the shutter speed manually, and use auto-ISO to ensure correct exposure if the light changes. Spitfire MH434, keeping low after taking off. 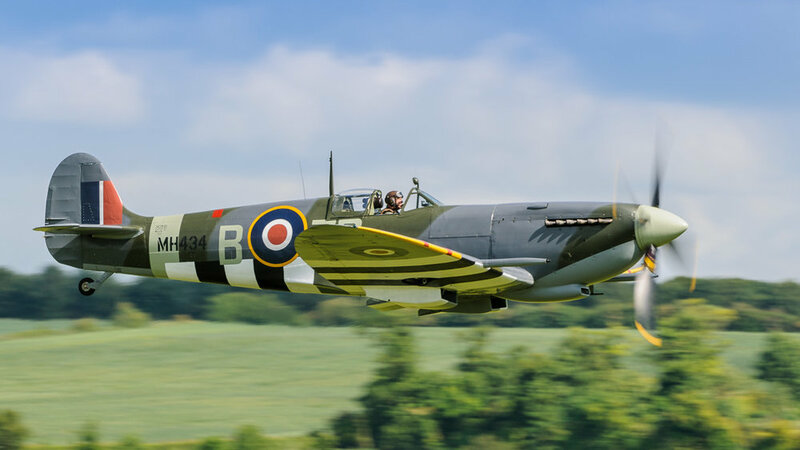 The aircraft is moving quite fast, so a moderate shutter speed helps convey movement by blurring the background, and revealing propeller movement. With prop planes, there is nothing worse than a propeller frozen static in flight. 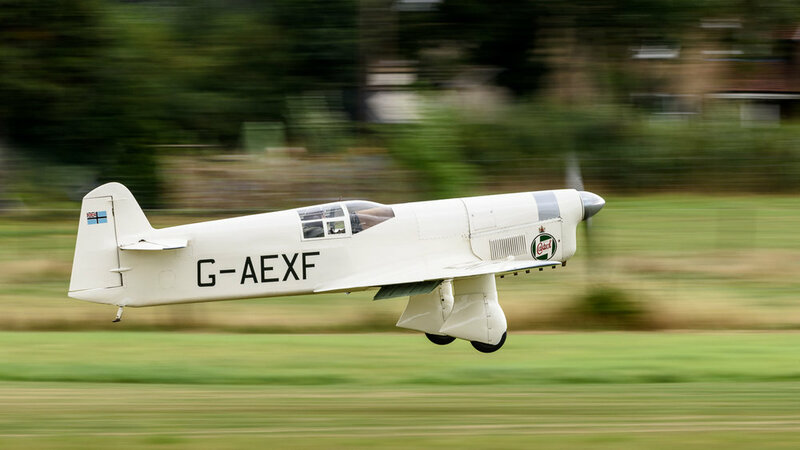 So, for props, use shutter priority, and a speed around 1/250 sec, panning carefully with the plane to get the effect of prop movement, while keeping the plane sharp. Helicopter blades rotate more slowly than props on fixed wing aircraft: you may need to go below 1/200 sec to get a good motion blur on them. On take off and landing for both props and jets, it is good to add motion blur to the background to convey a sense of movement: if you are confident of your panning technique, try following the aircraft using 1/80-1/125 sec (but expect to lose a lot!) One wrinkle is that on a bright day, even at minimum ISO, you may get f/20-f/22 at these slow shutter speeds, and that will reduce your image quality, especially on small-sensor cameras. 1936 Percival Mew Gull (G-AEXF). The slow shutter helps convey an impression of speed. Modern image stabilization (IS or VR) built into lenses and some camera bodies can really help to minimize the effects of camera shake at slow shutter speeds: even at around 300mm focal length it is possible to get a good proportion of shots sharp at low shutter speeds. On my own cameras and lenses, I've found that VR is helpful below 1/500sec exposure, but I have it switched off for shutter speeds faster than 1/500. In general terms, this means that for props I have VR on; for jets, it is usually off. Be sure that VR is switched to normal not active if that is what your lens supports. Metering: you'll likely need to set positive exposure compensation, especially when aircraft are flying against typical UK grey skies. Try starting with +2/3 - +1 exposure compensation with matrix metering and go from there, pushing the bright peak on the histogram (that represents the sky) as far over to the right as possible without getting clipping. Set the blinkies (highlight warning) on: keep an eye on them and the histogram as the light changes during the day, and be prepared to make frequent changes. Battle of Britain Memorial Flight briefing. The personnel gather in the shade of one of their aircraft, a Hurricane. Before and after the flying, there are likely to be pilots and crew attending to their planes or being briefed. 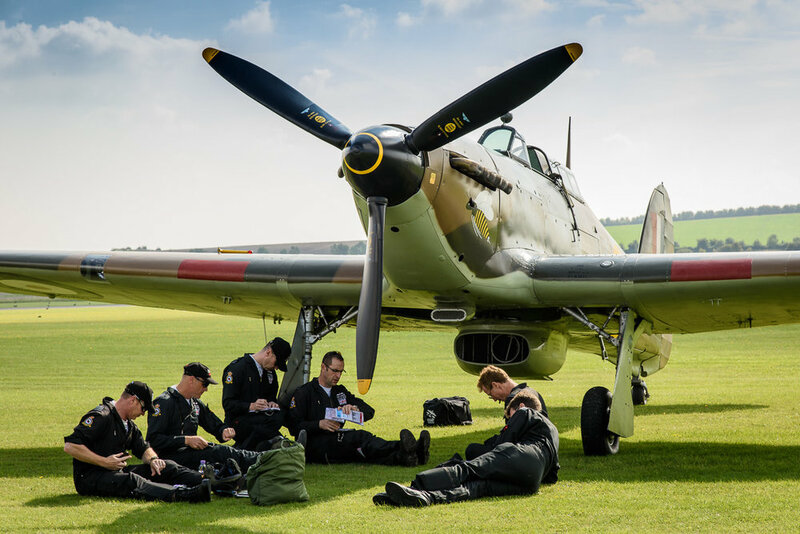 Sometimes, there will be re-enactors around the planes, or walking among the spectators, dressed in period costumes, providing extra atmosphere. Keep an eye out for other spectators: they are a rich source of images (just try to be respectful, and avoid portraying other people in unflattering ways: what goes around comes around). P-51 Mustang “Tall in the saddle” takes off from Biggin Hill.